2/1/16 - 3/1/16 ~ . Today we have successfully conducted session at GBE School from 9am to 12noon. Please find the highlights of d session and pics related to it. 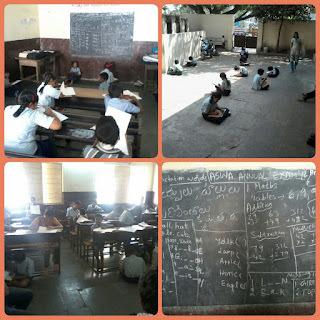 We are successfully conducting our weekly sessions at GBES school every Monday from 9am to 11am. 1. We are regularly conducting sessions at GBES school every Monday from 9am to 11am. 3. 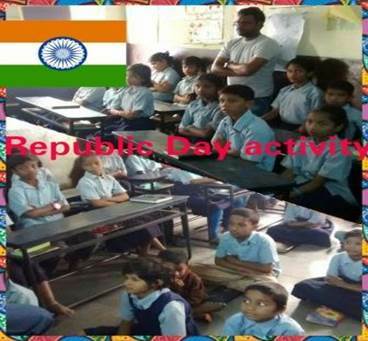 We have successfully conducted various events such as Games on the occasion of children's day, Republic day. 4. 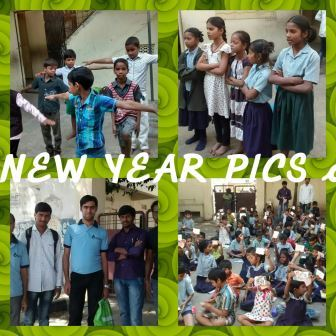 We also celebrated new year by distributing greeting cards , gifts on the occasion of new year. 5. We have conducted exam for the topics which we taught from starting of the year to till date and we are happy to see the improvement among the children's during this period. Please find the complete details of sessions from 14-09-2015 to 8-2-2016. • Started the session with a song which was continuation of previous class. • Explained Sarala Padalu in puzzle format,told story and asked story related some questions. • Explained some missing letters in Telugu and few general knowledge topics. • Started the session with a song. • Distributed stars to the students who maintained discipline in the class. • Explained story clearly and related some queries have been asked. • Explained the students regarding puzzle games in both English and Telugu. • Allotted task to the students for Dasara Holidays. • Discussed about task allotted to the students for dasara holiday and collected the things prepared by the students. • Taught a patriotic song completely. • In Mahatma Gandhi class, explained about vowels, consonants, capital and small letters and words antakshari. • For other classes, commonly used words in English and Telugu. 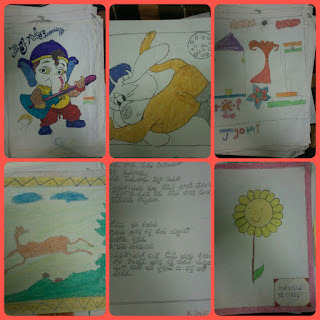 • Allotted homework to prepare a list of vegetables and fruits in English and Telugu. • Collected the task done by the students who didn't bring in previous class (wealth out of waste). • Taught a new patriotic song. • In Mahatma Gandhi class, explained about indoor and outdoor games and also allotted the task to the students to write 10 words starting with letter 'A'. • Few things were shown to the children and asked them to explain. • Conducted games on the occasion of Children's Day which was the first game competition in 2015. • Gifts distributed to the winners of the games conducted on the occasion of Children's Day. • Few cultural activities were performed by the school children actively. • Revision of the patriotic songs which was taught already. • Distributed the weekly gifts. • Explained discipline related to the exercise done in the prayer and children solved the puzzles excellently through Jig Saw Type Puzzle. • in the absence of main co-ordinator it was a bit difficult to handle the class but tried our best and distributed weekly and monthly gifts to the children. • In Swami Vivekananda and Mother Teresa class explained about Sarala Padalu, Guninthalu and dictation words of guninthalu. • Started the session with revision of previous class. • In Mahatma Gandhi class, dictation of English hard words and some self introduction questions are explained. • Separately focused on the students who are facing difficulty in telugu ( Achullu & Hallulu). • Apart, conducted dictation of Sarala Padalu to the students who are able to read and write Telugu (Achullu, Hallulu & Guninthallu). • Above all, concentrated on the students who are unable to the write Telugu individually. • Started the session by dividing the students into four groups as it took lot of time to control the students. • Later, explained English hard words, general questions and telugu(Achullu, Hallulu & Sarala padalu). • Started the session with two motivational stories and few questions are asked to get back the students attention. 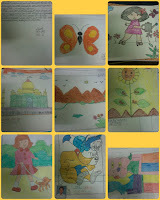 • Explained about our country (INDIA) through PPT slides. • Explained how to respect elders and discipline. • Conducted exams to all the sessions. • Explained about health related tips. • Taught some simple English words to the Non- Telugu students. • Expounded patriotic song with meaning. • Celebrated New Year by knowing the resolution for the upcoming year and distributed greeting cards and chocolates to the students and staff. • Students performed some cultural programs actively by singing song and dance. • Revised two songs with meaning which was previously taught. • Taught moral stories with explanation and also write numbers into the words format in maths. • Small experiment was shown to the students and explained about density and pressure. No session took place due to Sankranthi Holidays. • Revised two songs which were taught earlier. • Explained some question usage words in English (how, what, when, where etc...). • Expounded addition in puzzle format and given one puzzle as homework. • Intimated games are going to be conducted on the occasion of the Republic Day. • Conducted games on the occasion of Republic Day which was the first game competition in 2016. 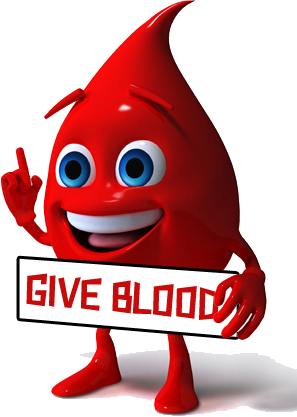 • Event was extended by two hours due to lack of volunteers. • Celebrations on the occasion of Republic day started the event with Flag hosting and National Anthem. • Some cultural activities are performed by the students actively and distributed chocolates and biscuits to the students and staff. • Prize distribution was held to the students who are winners, first and second runner up of the games. • Discussion with the students who are irregular to the school. • Explained how to identify the time in the clock, difference between seconds, minutes and hours. • Expounded full names of great leaders, some GK questions, meaning of country, state, city, street and area with examples and taught maths puzzle related to addition. • Appreciations to the students through gifts who helped to conduct the games on the occasion of Republic Day. • Discussion with the students who are irregular to the school and examined the homework allotted to the students. • Taught maths puzzle and discussed few GK questions. • Finally, meeting with the HM and Teachers regarding the improvement of the school and suggestions were taken.